I just got this image in my head the other day. I'm not sure why. I imagine Batman finding some kind of clues that lead him to where ever he is now. He realizes the scope of this mystery and contacts Supes who is just arriving. I wanted to keep it simple and clean and show the contrast between these two. If I get around to coloring it I'll try to maintain that approach. I'm pretty content with this one, I think my Superman needs work though. 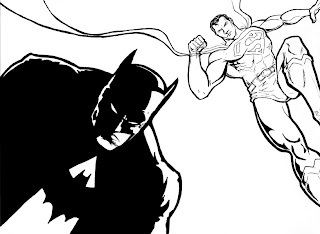 Yeah, i really like how Bats looks in this one....Supes looks a little off, but Batman...is right on! Cool! Thanks man I appreciate the comment. Stay in school and just say no to drugs...especially that heroine cheese.